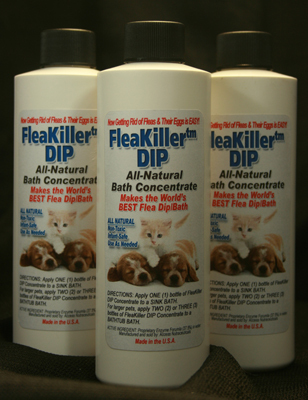 NATURAL FLEA TREATMENT – FleaKiller – GREAT FOR PETS WITH SENSITIVE SKIN – Really Works Great! INTRODUCING…A BRAND NEW FLEA TREATMENT! FleaKiller™ Brand Flea Spray, Flea Dip and Flea Powders are Superior Products. And they kill TICKS too! Are You Using NAZI POISON on YOUR Pets? Did you know that when you use the PESTICIDE-BASED flea treatments, you are probably using ORGANOPHOSPHATES? Organophosphates are derived from the same chemicals that the Nazis used in their infamous Nerve Gas! Why would you use that on your pets and children? You only might have used them in the past because you didn’t know any better. So what about “Natural” products? If you have tried any of the other “Natural” flea treatment products out there, you’ve probably not had very much luck with them. That’s because they are weak and ineffective. Their approach is to attempt to “discourage” fleas from coming around. I’m sure you don’t want to just “discourage” fleas – you want to kill them. But you don’t want to poison your pets or your family with dangerous poisons in the process, do you? So What Should You Use to Kill Fleas? We’re introducing a BRAND NEW Flea Treatment that is based on our PROPRIETARY ENZYME FORMULA. WHAT IS FleaKiller™ MADE OF? FleaKiller is a special formula of four different enzymes that literally DIGEST INSECT PROTEINS! This AMAZING FORMULA works on the same principle as digestive enzymes in your own body. Your body uses enzymes from your mouth, stomach and small intestine to aid in the digestion of the food you eat. Enzymes are proteins. They are responsible for the thousands of chemical reactions that sustain life. There are lots of different kinds of enzymes and they work differently when combined in different ways. It’s kind of like how different chemicals do different things when mixed together. FleaKiller™ is a proprietary formula manufactured in the U.S.A. by the makers of LiceKiller – America’s #1 Natural Head Lice Treatment. Our facilities are in Visalia, California. 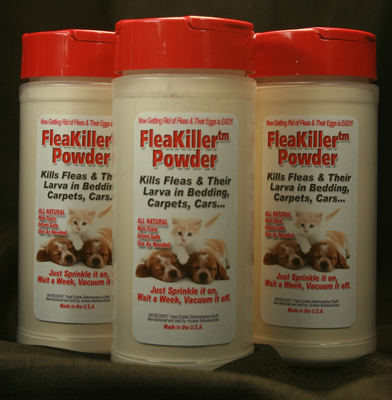 ARE THE ENZYMES IN FleaKiller™ SAFE TO USE? Our PROPRIETARY FORMULA of FOUR DIFFERENT ENZYMES are designed to break down and digest INSECT proteins. They have no effect on humans or other animals. Only Insects. WHAT DO THE ENZYMES IN FleaKiller™ DO TO INSECTS? With insects, our formula literally digests the exoskeletons of the bugs. Given enough time, it would completely digest or dissolve the fleas. In the short time of a typical treatment, you will notice that the spray and dip will kill the fleas quickly. Their exoskeletons are in the process of dissolving as you rinse them down the drain. HOW OFTEN CAN I USE FleaKiller™ Products? It is totally safe for all humans – even babies! That means you can use it ANY TIME you see a flea. If you get them all out of your heads and they come back (that happens all the time because once fleas are laying eggs in your area, you have to kill the new ones that hatch), you can use FleaKiller right away. 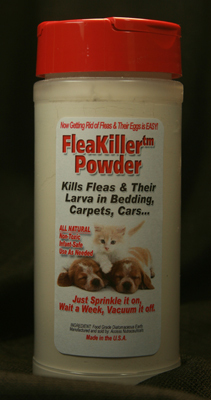 Use FleaKiller anytime you see fleas. WHAT ABOUT THE FLEAS IN MY ENVIRONMENT? FleaKiller™ is SUPER EASY to use! 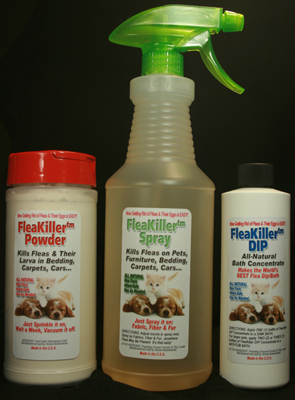 The huge 28 oz bottle of FleaKiller Spray is for killing fleas on your pets and in your environment. Spray it on your clothing, furniture, toys and bedding too. And don’t forget the cars and car seats. Spray it on any Fabric, Fiber or Fur. You can also use it on carpets if you want, but we also have our FleaKiller Powder for carpets that is designed to work best on that area. FleaKiller™ Spray will not stain and since it is water-based, there’s no danger to your fabrics. HOW DO I USE FleaKiller™ Spray? 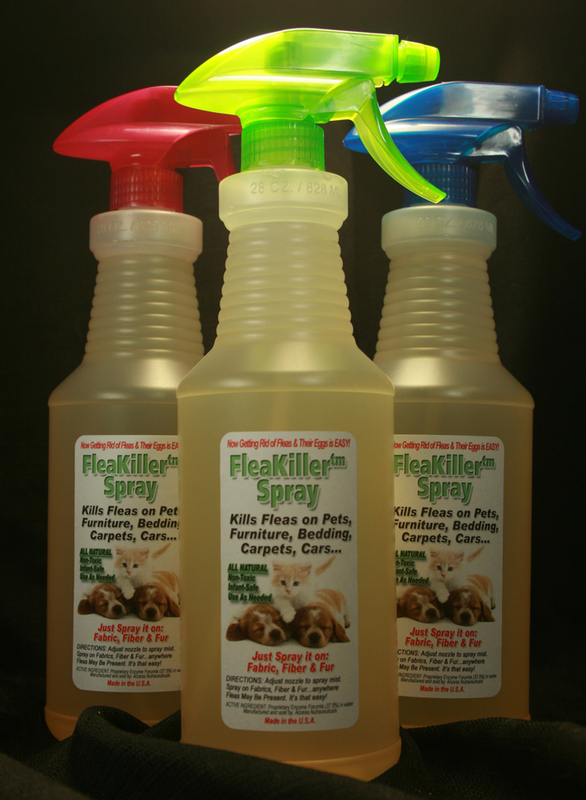 FleaKiller Spray comes READY TO USE in a handy 28 ounce Spray Bottle. Just adjust the spray to a mist and pull the trigger. HOW DO I USE FleaKiller™ Dip? FleaKiller Dip is a CONCENTRATE. Add ONE BOTTLE to a sink bath for your pet. Add TWO or THREE bottles to a bathtub bath for your pet. Make sure to get all the fur wet. Avoid contact with the eyes. HOW DO I USE FleaKiller™ Powder? But the tiny shells do a lot of damage to insects. They cut their exoskeletons open and the insects die of dehydration. 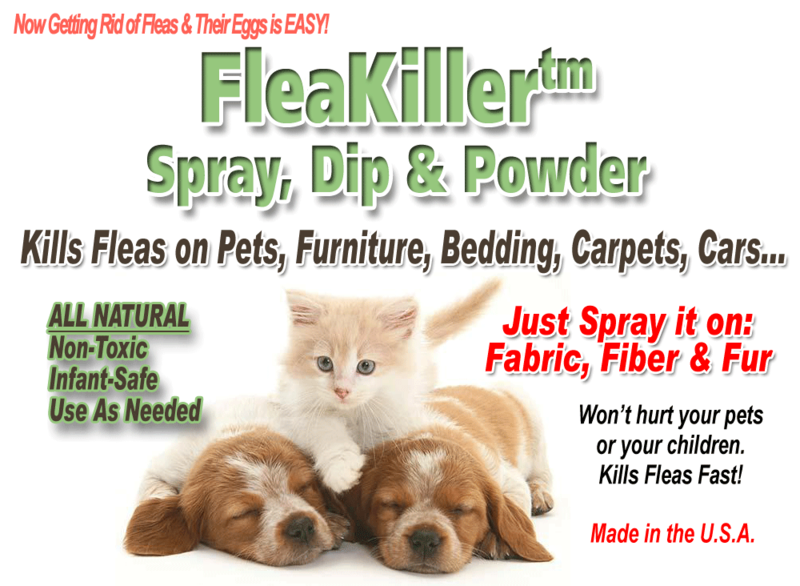 FleaKiller™ is available NOW to help you get rid of fleas…THE EASY WAY! IT’S REALLY AMAZING HOW WELL IT WORKS! Get ALL THREE PRODUCTS in a Money-Saving KIT! Regular Price for All Three Items is $59.85. Copyright © 2017 by LiceKiller.com. All rights reserved.